Your first task is to set up rapport with respondents, when moderating a focus group or depth interview. Rapport is the foundation for a conversation and discussion. You need respondents’ cooperation to have an open conversation. Respondent want to help the moderator. And they will do so when you build rapport. It’s the moderator’s job to build rapport. Writing the moderator guide prepares you for conducting focus groups or depth interviews. Write, read, and rehearse your guide. It is your script. Know your research objectives and topics well. Study your questions. Rehearse questions and anticipate answers. Moderating is part mechanical and part dynamic. The mechanical part is writing the moderator guide, asking the main questions, and listening. The dynamic part is asking follow-up questions, probes, and prompts. You can prepare for most of that. To get respondents to relax, you must appear and sound relaxed. Respondents may mirror your tone and actions. Before an interview, place yourself in a relaxed, confident, and friendly state of mind. Do whatever you do to feel relaxed and confident. Relax… it rubs off on your respondents. Start building rapport by showing respect to your respondents. You may be different from your respondents, and may not agree with them, but be sure to respect them and keep an open mind. Treat people with respect, and they’ll do the same. The respondents are the experts at using a product or service, regardless of education and economic background, so respect their knowledge, feelings, opinions, and perceptions. Most people want to help you in an interview. They are willing to talk about their product or service experience, or expertise. They have already agreed to talk to you by being in the interview. Start building rapport as soon as you meet a respondent. This can take a few minutes or up to half an hour. While setting up rapport with someone, you enter his or her world. Be sure to ask the respondents about their world. Greet respondents in a friendly, cordial, and relaxed way. Use their first name. Tell them your name. Set the tone and pace. Show respect. Thank them for agreeing to an interview. If you are in a face-to-face interview, smile and make direct eye contact. Tell them the interview is market research, and answers are used for research only and that their names will remain anonymous. Tell them what to expect during the interview. Tell them what they will be doing, and how long it will take. If you are offering incentives, tell them when they will be paid. Remind them they are being recorded. Get permission first! Start with easy, factual questions. Ask about products or services they use or their hobbies or favorite sports. Allow respondents to speak freely without worry or embarrassment. Here is an introduction checklist. Write it into your moderator guide. Greet each respondent. Use his or her name. Tell them briefly about yourself. Tell them what you do. Tell them about the general topic of conversation. Tell them companies want to hear their views. Tell them their answers are confidential and that their names will remain anonymous. Tell them what to expect during the interview. Tell them there are no right or wrong answers. Tell them how long the interview will take. Remind them they are being recorded. If you are going to offer drinks or food, tell them. 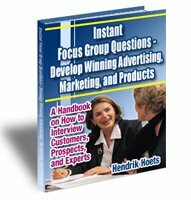 If you are moderating a focus group, ask the respondents to introduce themselves. Ask them to allow equal talk time for everybody in a focus group. Start with easy, factual questions. During the introduction phase, respondents will evaluate you. First impressions are lasting impressions, so be friendly, polite, and positive. Above all, show respect. Remember, most people you interview want to help you with moderating. And the majority respond accordingly. Start your qualitative research session with rapport building.